2006 "In The Winner's Circle"
May 27 - Judge: Mr. Paul Hudson - wins WB, BW & BOS over Multi BIS Special 'Nasya' obtains her Championship in limited Shows! 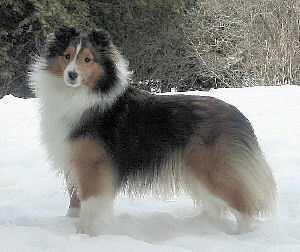 New Champion Triadic The Magic of Crinan "Maggie" - Feb 18th, wins WB & BW - 4 pts under respected Judge Mr. Walter Pinsker. Special Thanks go to handler, Shirley Perry. Proud to announce that "Miss Indy" - Crinan's Miss Independence is now the dam of 3 Champions from her first litter ( 1 AM & 3 CAN CH's). MOTCH Crinan's Not An Illusion ADC, AADC, MADC MJDC SGDC JWW "Tessa" obtained her Master Agility Dog of Canada "MADC & first place! Way to go Denise & Tessa! MOTCH Crinan's Not An Illusion ADC, AADC. SGDC, MJDC, JWW - July 16, 2006 at Canada Cup "Tessa" achieved her Advance Agility dog title. She also obtained her Master Jumper Dog Title and obtained two more legs in the Steeplechase division with a first and second placing.Not bad for 8 1/2 years old. I was so..... proud of her. Crinan's Caught In The Act - Shelby will be bred to BIS Multi BPIS Ch Shelhaven CounterStrike - sables expected July 2006.